Being Frugal and Making It Work: Engagement Rings: For the Rest of Your Lives Together! Engagement Rings: For the Rest of Your Lives Together! My husband and I will celebrate thirteen wonderful years of marriage on the 20th of this month, which also happens to be the first day of Spring. I will always remember the day he proposed to me, where we were, how he proposed and the feeling of excitement that I felt as he handed me an engagement ring. That moment changed the rest of my life! My engagement ring was the most beautiful diamond ring I had ever seen. As I stared at the ring, I knew that this was the beginning of our lives together and I couldn't have been happier. He took the time to choose the band, help design the setting and hand-picked the diamond himself! I couldn't believed that he put so much thought into it. I'm truly impressed and loved in so many ways! One of the most important factors of your wedding is the wedding rings that you choose to share with your partner for life. The ring is symbolic and shows that your love has no end. Until today, I had never heard of Vatche, but have quickly become a huge fan! Vatche is one of the foremost designers of unique engagement rings and wedding bands and his designs are absolutely beautiful! Whiteflash.com is the first company in the U.S. to offer an exclusive brand of Hearts & Arrows diamonds. 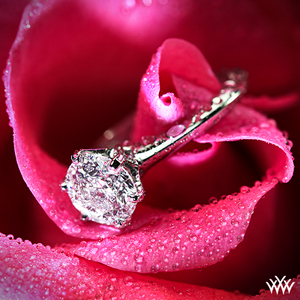 Whiteflash also offers original, handcrafted platinum and gold settings, diamond engagement rings and wedding bands, custom designs and specialty jewelry. **Brought to you by your friends at Whiteflash.com. I only recommend products or services that I think my readers will find useful. All opinions are my own, results may vary.